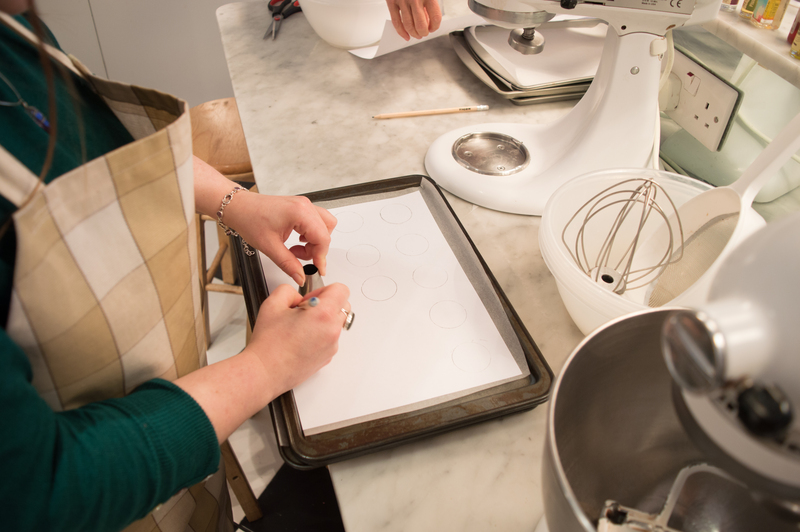 The class was held at Angel Food Bakery in the South Lanes in Brighton. I have always loved their cupcakes, so was really happy to discover that they hold cooking classes too! It was reasonably priced and was due to last 3 hours. We actually overran by at least an hour, but the lovely lady running our class didn’t seem to mind! Now, I love the internet. It is such an amazing resource and you can teach yourself many things. But sometimes, it is really good to learn in a face-to-face environment. Especially with something as temperamental as macaroons. Our class was teeny, the kitchen only held 6 students. So we each got one on one tuition from the teacher. We were given two recipes to make, which yielded 30 macaroons in total. The class itself was £45 per person. Now if you have ever purchased macaroons, then you would know that £45 to learn to make macaroons and leave with 30 macaroons is actually very good value! I choose to make strawberry macaroons and then chocolate macaroons with a chocolate orange ganache. Now my aim with this blog is to make healthier versions of classic recipes. I warn you now, the recipe to make these macaroons is definitely not healthy. 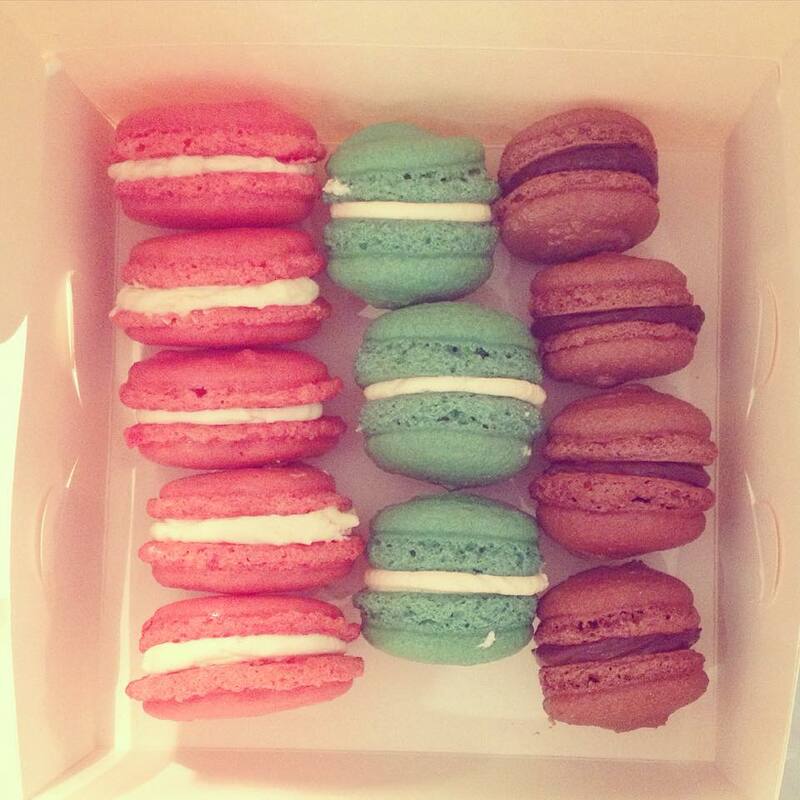 But I aim to use it to create healthier macaroons in the future – watch this space! 250g butter cream icing – I used strawberry butter cream and orange chocolate ganache. Heat the oven 150 ºC. Then prepare your tins. At home I use a silicon macaroon mat that I got from lakeland. you can see it here! In the class we just drew circles onto baking paper. In a stand mixer (we got use Kitchen Aids – this made me very happy) whisk the egg whites until they make soft peaks. Slowly add the caster sugar . 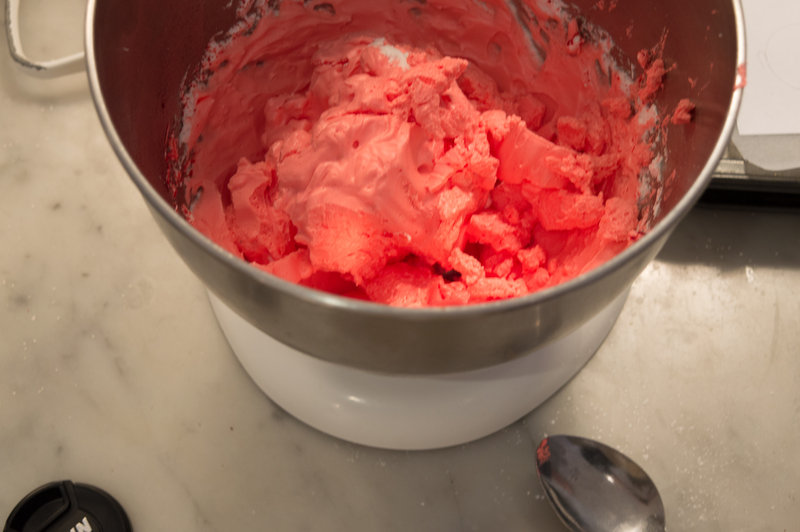 Leave to whisk for approximately 4 – 6 minutes, until stiff and glossy. Add the food colouring in the last few minutes. In a separate bowl sift the ground almonds and icing sugar together. Don’t be tempted to use any of the residual lumps of almonds, pop these back in the bag and use for something that needs them – like a nice fruit cake! OK so this bit needs a degree of delicate handling. gently fold in the almond mixture to the egg whites. The old figure of eight method works well. Make sure you scrape down the sides as you go along. Spoon the mixture into a piping bag and pipe little blobs onto the baking mat Don’t worry, you will get little nubbins on the top. We will deal with these later. Now take the tray and drop/bang the trap with the macaroons onto the counter top. This removes the air bubbles and creates a little ‘foot’. If your macaroons are not smooth on top at this stage, then you can use this nifty little trick. Get a glass of cold water, dip your finger in and flick anyway any excess water. 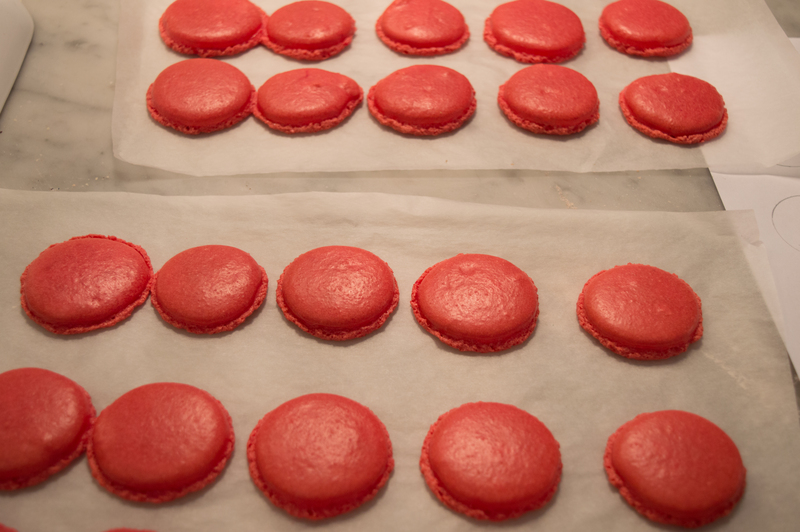 Then gently dab your finger on top of the macaroon, quickly to squish in any imperfections. The water ensures that your fingers slips off the mixture as opposed to putting fingerprints in the dough. 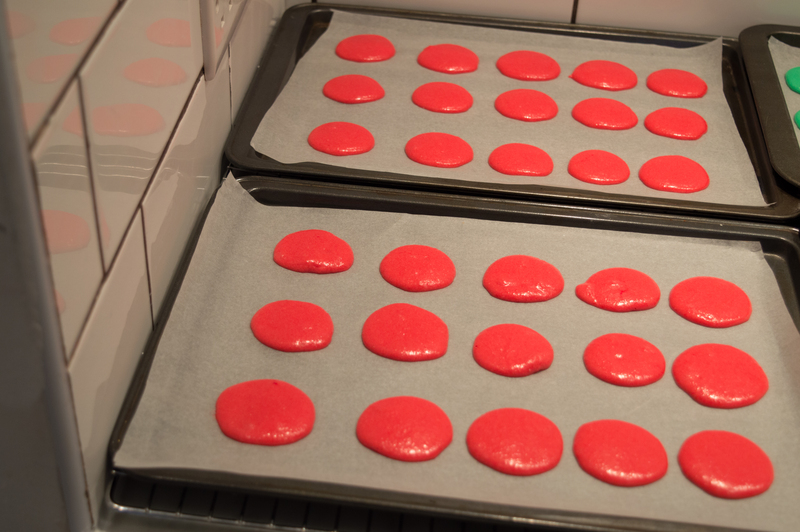 Leave the macaroons on the surface for around 15 – 20 minutes. This gives the meringues time to form a shell. Allow to cool completely and fill with your favourite buttercream or ganache filling! Sandwich two macaroons together and voila! Beautiful french style macaroons. 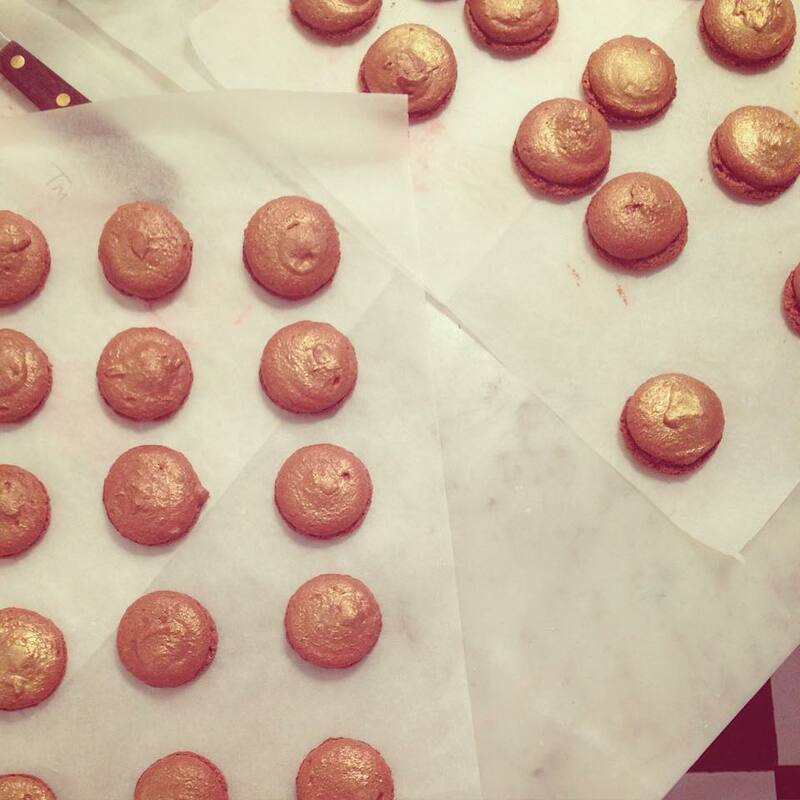 I dusted my chocolate macaroons with edible gold glitter! Now I am not going to say this recipe is simple. It isn’t. But it feels pretty amazing to be able to master macaroons. They are so pretty and they make fantastic gifts! I am sure the more you make them, the easier it becomes! Strawberry Cream Macaroons, Pistachio Macaroons and Chocolate Macaroons with Orange Ganache! I hope you enjoy this recipe! And I really recommend taking cooking classes if you can! They are SO much fun! Posted on July 14, 2015 January 10, 2016 by TinaManahaiPosted in RecipeTagged baking, biscuit, biscuits, Brighton, Cooking, french, ganache, Gift, homemade, Inspiration, kitchenaid, lesson, macaroon, meringue, review, treat.